On October 21, 2006, Gladys Leblanc Clark, an 88-year old master Acadian spinner and weaver from Duson, was inducted into the “Order of Living Legends” of the Acadian Museum. She learned to card and spin by age eight, and perfected these skills in her teens. Over the years she has stressed a commitment to preserving the tradition by demonstrating it to others. She has participated in numerous festivals, showcased her skills at the Smithsonian Institute in Washington, D. C., was an Instructor for the Acadian Handicraft Project, and has participated in the Louisiana Folklife Apprenticeship Program. 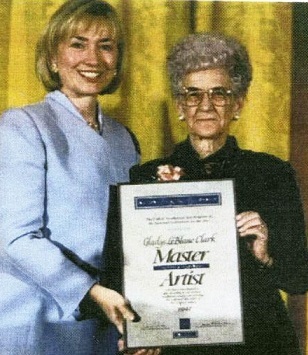 In 1997, Mrs. Clark was awarded the National Heritage Fellowship by Hillary Clinton. Mrs. Clark donated her loom and miscellaneous materials, including her handmade scrap book, raw materials and cording paddles to the Acadian Museum which has developed a special exhibition dedicated to her lifetime body of work.